Sculptor Penny Hardy combines discarded metal items to create three-dimensional figures based on her body’s own dimensions. Although the physique has the same core reference, each sculpture is a unique creation based on the varied assortment of rusted gears, bolts, and screws used in its composition. In display, the works are either presented alone or in pairs of two, and express fundamental emotions through their relationship to the environment or each other. “Through using my body frame as a canvas I wish to communicate some of these effects through the medium of sculpture,” she tells Colossal. “By using discarded man-made metal items, which have been so skillfully made and used to create their own mechanical energy, I hope to extend their life in another form, re-use that energy for a different purpose, and exchange their function to create a new entity.” You can see more of Hardy’s sculptures based on her own form on her website. 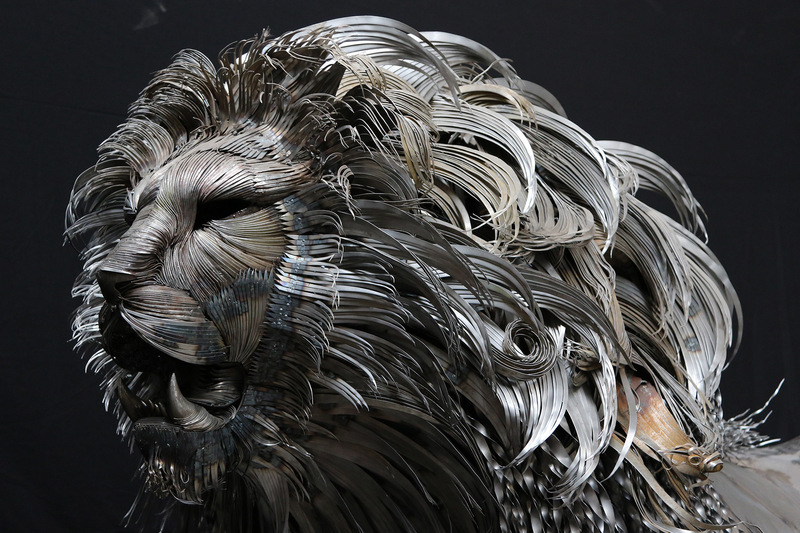 Sculptor Selçuk Yılmaz (previously) recently finished work on this gigantic lion sculpture of hammered and welded metal titled Kali. The Turkish artist has mastered the ability to form the flowing mane, facial features, and bold muscular structure of various large cats from curled steel fragments. You can see many of his earlier works over on Behance. Gathering spare pieces of metal, John Brown assembles his findings into sculptures of colorful butterflies, insects, and birds. Although the assemblages are formed from salvaged materials like nails and bicycle chains, the pieces somehow remain delicate, wings appearing just as thin as a butterfly’s own. After welding each piece together, Brown finishes the sculpture by painting the wings with oil paint, accurately copying the markings of specific species such as the Holly Blue and Red Admiral butterflies. For Scott Raabe, his craft lies is in the very fine details—the intersection between pipes and other cuts of metal one might typically glance over without a second thought. It’s in these fine crevices that Raabe welds layered patterns, using his seven years of expertise to create interlocking designs that seem to glow a metallic rainbow sheen after being welded. For the layperson, typical welding this is not.